This 775 Top & Bottom Glue Spreader has a nominal length of 56″ and a standard pass line height of 30″. 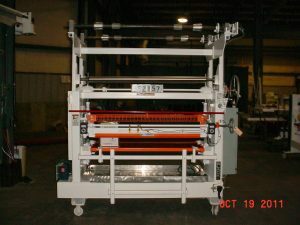 It includes pivoting infeed table, electrical interlocks, and standard NEMA 12 Electrical Enclosure. This machine will be completely rebuilt to your specifications; contact your nearest Sales Associate for details.